We may be motivated to express our desires, but could find it difficult to communicate them directly this morning. Late morning is good for socializing, even though we are feeling more independent than usual. This morning, try not to allow resurfacing issues from the past interfere with your responsibilities, dear Aries. A repeating theme comes into focus today, however, and involves facing up to truths about the past. You may need to take a realistic (possibly hard) look at intimacy matters or shared finances. Delays and restrictions are likely, and are best faced with patience, as difficult as it may be to muster. Keep in mind that delays are not necessarily setbacks. You may not be able to move forward as quickly as you’d like, but if you do so step by step, then you’re more likely to do it successfully. Deal fearlessly with insecurity – learn from what you discover about yourself, as anger can often reveal our vulnerabilities. The Moon is in your sign all day, amping up emotions, and increasing your influence and visibility. Recent years have demanded that you get a little more serious about close relationships, dear Taurus, and Saturn will continue to test you for a while longer. Uranus in your privacy sector is another long-term influence, but this one is helping you to free yourself from your attachment to certain elements of your past. This may have involved sudden surfacing of past matters, possibly including secrets. This can be unsettling but liberating in the long run. In fact clearing yourself of the burden of secrets and guilt about the past is something that serves you wonderfully in the present. Even so, these two energies are clashing right now, and ambivalence is likely. Keep in mind that committing yourself to someone is best done with a clear conscience. Try not to let fear rule. The Moon is in your privacy sector all day, and this can keep you in a supportive rather than starring role just for now (this changes tomorrow!). You’ve been making changes in your social circle, dear Gemini, whether these changes were of your own doing or if they were required of you due to circumstances in your life. This week and especially today, you might be feeling some pressure with work or daily routines demanding a lot of attention, but your social life can also lead you to great distraction as you experience ups and downs in that arena of your life. The challenge now is to strike a balance, as an either-or approach simply won’t do. Keep in mind that others’ difficult or withdrawn behavior early today is likely driven by insecurities. Helping out a friend today can feel good, and this may be done through an inspiring, positive conversation. Right now, it may be challenging to meet the demands of both your career/public life and your recreational life, which can include a romance, dear Cancer. Changes on the work front can sometimes throw you off center and exhaust you. Sudden changes with authority figures, parents, or work can also take their toll on your love life and leisure time. You may be feeling restricted or lacking when it comes to excitement in your personal life at the moment. It is not a good idea to mix personal and professional matters right now, as others may be frowning on it. As well, reputation issues can be a small concern now. Some of you could be experiencing a feeling of creative blockage or lack of confidence. It doesn’t help that people around you seem to be reacting and acting from a place of insecurity. However, the day has its very bright spots, and there can be good financial/business news. Responsibilities on the home front can certainly be part of your world these days, dear Leo, and this is an energy that is likely to continue for a few months in 2015 as well. It’s all about bringing structure to your home base, and some shuffling around is likely as you get to the point of truly feeling settled. This week and especially today, responsibilities to home and family can feel a little weighty, particularly as opportunities to get out and about present themselves, whether through travel or other physical adventures, or on an intellectual level. Try to get to a healthy balance rather than choosing one or the other. For some of you, a trip may need to be delayed. There can be some awkwardness in social interactions early today, and passive-aggressiveness around you can be irritating. However, there are some very bright spots to the day, especially as it progresses. Act on charitable impulses. This is a good period for sorting out business and financial matters, dear Virgo, as you have been feeling a little scattered in this area, particularly when it comes to finances or business related to a spouse, ex- spouse, or other forms of income that don’t come from your immediate income. The sharing of assets and debts can be an issue that causes a certain amount of stress, as it may be up in the air or it hasn’t been tended to with vigilance. You can be immersed in other interests and projects these days, but don’t let lack of interest turn into neglect of important details. Watch this morning for insecurities that prevent you from sharing yourself naturally. It’s a temporary blockage, and it allows you to look more closely at your fears and automatic reactions. Lack of faith or trust in a person experienced now may in fact reflect deeper issues within yourself. There can be challenges involving finances, basic values, or valuables this week, dear Libra, and possibly a partner or significant person in your life. Decisions in general can be hard to make, and you may be stuck on whether or not to stick with traditional or proven methods, or whether to stick your neck out and take a risk. Alternatively, some of you could be feeling quite defensive of your own practices, methods, and values, while someone else wants you to break the rules or loosen up. Immediate solutions are unlikely. In fact, this energy is a recurring one that will repeat at certain points next year. For now, however, try to find a balance rather than pit one thing against another. While there can be some insecurities to get around, today is quite nice for friendly gestures. You could experience some physical complaints right now, dear Scorpio, that perhaps reflect inner emotional conflicts. Alternatively, feeling under the weather can prevent you from accomplishing what you previously set out to do. Try not to swing between alternatives too drastically and instead work on making adjustments to your plans that more realistically reflect what you are truly able to accomplish. 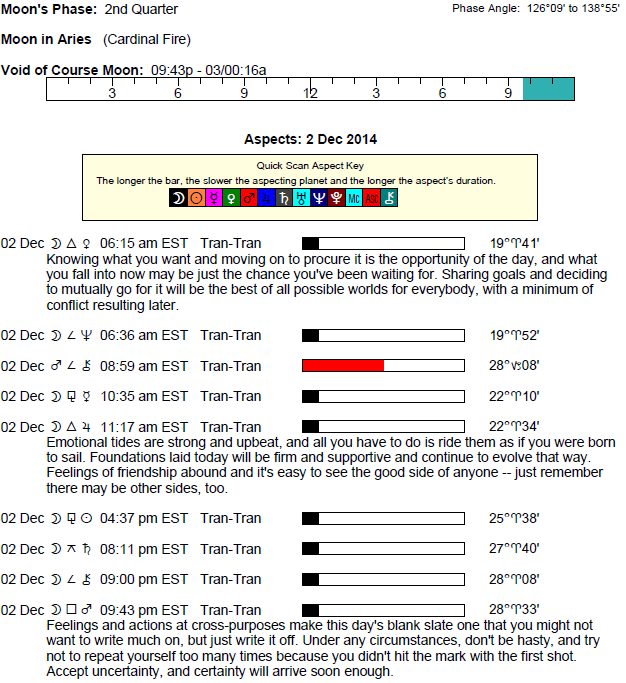 Today’s energies are ambivalent at best, and your feelings about (not necessarily for) someone can be confusing. You might be in the position to doubt a special person, but do take into account possible insecurities clouding your vision of a situation. There is strengthening energy with you for relationships with colleagues or bosses/parents. The desire to express yourself more freely and creatively right now can be undermined by self- limiting attitudes or some level of guilt and fear, dear Sagittarius. Creatively, you can feel a little stuck simply because you don’t yet have a solid plan to back up your goals. If plans are not coming to you intuitively, consider that you’re simply not ready for them, and try not to push yourself. Direction will eventually come. Today is good for expanding your horizons or your reach through sharing your ideas and beliefs with others. Relationships with extended family can improve. If you have been toeing the line or otherwise holding yourself back, dear Capricorn, this week you could experience a very sudden and overwhelming desire to break the rules. Tension can result if you are not honoring both needs in a balanced manner – one need is to stick with the status quo, and the other is to do something that totally breaks the routine. In truth, you can satisfy both, so avoid thinking that it’s either one or the other. If you deny one need, then the other will emerge in an unhealthy way, perhaps in your own behavior or it might take the form of circumstances in your life. Act from your heart instead of simply reacting to others. On some level, you may be pulling yourself away from others, dear Aquarius. This might be due to a sense that people could limit or delay your progress, albeit not intentionally. You could simply feel that your social life can cost you too much time and energy. Try to find a balance rather than cutting one thing out in order to handle another. You might also have trouble deciding whether to go out on a limb and call upon your inventive side, or to stick with things you know actually yields results, even if they are conservative ones. 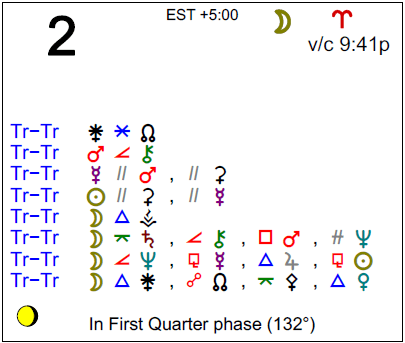 Today’s Moon position, however, helps you to find a solution by stepping back from the problem and looking at it objectively instead of emotionally. Try to get to that place. You’re in a better position to bring more stability in many areas of your life these days, dear Pisces, but bringing stability to your financial and business life can be more challenging. You may need to learn to live with some level of insecurity in this area, as you experiment with different ways of bringing in money. Part of you might want to branch out and take a few risks, but another just as strong part of you craves more security. Some adjustments and reshuffling of your resources are necessary. It’s better not to suppress either need, but rather to find ways to satisfy both. Not an easy task, but a realizable goal nevertheless. 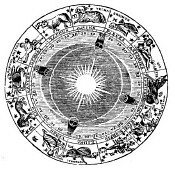 If Your Birthday is December 2nd, If Today is Your Birthday full horoscope here. You have many original ideas which you are able to communicate with ease. You are insightful and may be ahead of your time in your ideas and opinions. You suffer from believing that you are lacking in intelligence. You have difficulty asserting your own thoughts and opinions. 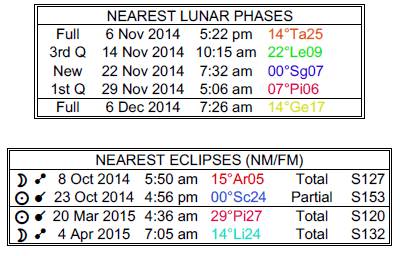 Sun 02° Taurus 54' 02"
Moon 22° Sagittarius 15' 06"
Mercury 08° Aries 04' 14"
Venus 03° Aries 14' 04"
Mars 15° Gemini 11' 24"